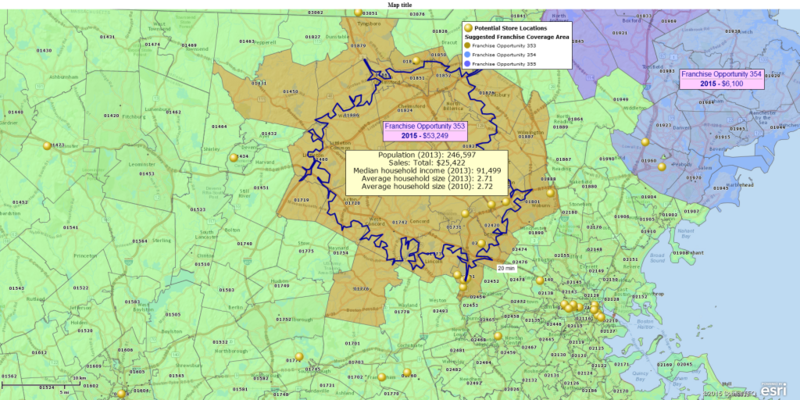 Drive time – For business mapping software developers, GIS graduates and MapPoint users, Drive Time refers to the polygon that results from deriving a constant driving time away from a central point in all directions along a road network. Put a point on the map and then imagine driving away from that point in a thousand cars, each one in a slightly different direction, for 30 minutes. The resulting mess, when viewed from above, is a drive time polygon. The actual definition of Drive Time has a variety of nuances to it. Driving time could mean the time it takes a vehicle to drive from point A to point B. people mix the two business mapping definitions up. Sometimes they mean the time to drive from here to there and at other times they want to know the area encompassing a 30-minute drive time. In Map Business Online you can select a point on the map and use the Drive Time button to create a drive time polygon. In the above example, that would be a 30-minute drive time polygon for that point. Map Business Online will also allow the user to change the drive time analysis from Time to Distance. This will also calculate a polygon, but in this case, it’s the driving distance polygon reflecting 30 miles in all directions along the road network from that same central point. If you used that same point to start a driving route and drove along the road network to another single point, 30-minutes away, you would have a route with a driving distance of X miles and a route driving time of 30-minutes. Advanced GIS applications offer the export of drive time polygon analysis results, which would be a matrix of distances or times. Map Business Online does not offer such analysis. We do however, offer the saved file export of your optimized driving route from the routing window. This will include the route driving time and distance estimates. Why Use a Drive Time Polygon? A drive time polygon comes in handy when your company wants to analyze operations taking into account the time spent driving the road network. One example might be a florist trying to determine the delivery fees for customer who live within a 45 minute drive of the shop. Perhaps he wants to charge $2.50 for 15 minute drives, $3.50 for a half-hour drive, and $5.00 for deliveries that take 45 minutes. Three drive time polygons will answer that question. Another example might be retail store proposed locations. The company may already know that few customers will drive more than 35 minutes to buy product at any store. After that 35-minute boundary, customer interest drops off. They never build a store in a location that has fewer than 20,000 households within 35 minutes of the proposed store. Drive time will be used to help define which locations are optimum. This might be called a drive time customer map. Yet another example – the ornery Sales Manager. “I don’t want my sales people spending any more than thirty minutes behind the wheel!” Mr. Nice Guy could apply drive time analysis to control where the sales people drive to – no more than thirty minutes from their starting place. In Map Business Online, map objects (polygons and circles on the map) are created by selecting a search tool and clicking the map where you desire your map object to be located. In the master Toolbar drop down on the Search Data in Circle button. Choose the bottom option – Search Data in Drive Time. The button will turn Green to denote selected status. Place your mouse cursor on your map at the center point for your Drive Time polygon. Click the mouse to drop the drive time point. In the mini-menu that pops up, insert your time restraint minutes in the box provided. (You may change Time to Distance here if you desire to.) Click Search Data. Choose a data set to search if you have one or simply close the dialogue and view your drive time polygon. Click out of the selected polygon to view its outline. Adjust colors or line thickness in the Drive Time adjustment box. So, make sure your clear on what the boss wants when she says, “Drive time.” Ask if she wants a drive time polygon analysis or the driving time between two fixed points. Dazzle them with your geospatial acumen. Once they’ve got the information they want, ask for a raise. This entry was posted in Uncategorized and tagged Business mapping software, drive time, MapPoint. Bookmark the permalink.